Land ho! Egg Harbor! Secure the lines and ready the boat. Adventures in town await! Befriend the bat that made a cozy home in the showers, and skip your way past the raccoons and minks as you make your way to town. Pop into shops on Egg Harbor Road as delectable smells from Casey’s BBQ fill the street. Slurp up a scoop or two from the Chocolate Chicken, then hop in your Radio Flyer, over the hill and through the forest, past the towering trees and gruffalos, to the beach, where rock forts and sandy waterfalls await. You leave a sandy trail all the way back to the dock, and as you drift off to sleep cuddled up in your cabin, the next port beckons. You cast lines once again as the sun rises. With sails full, you slice through the Strawberry Channel, with the tree-filled tufts of Jack Island and Adventure Island in the distance. A grumbling belly brings the shores of Fish Creek into view just in time. Perhaps a tub of salt water taffy at the confectionary will suffice, or better yet, fresh bacon and sea salt cakey perfection from The Singing Donut! Then off you go down Main Street, past your friends Nan and Jerry, to miles of trails at Peninsula State Park. Make temporary treehouses in white cedars, watch a family of ducks dig for their lunch in the shallow pond, and crackle on branches as you cross over the marsh to a sweeping view of town and the marina. Clarity waves, calling you back. With tired legs and a full heart, you take to the sea once again, heading north toward the Sister Islands, catching the fresh breeze all the way in to Sister Bay, just as the sun dips into Green Bay. We sailed into Sheboygan roughly a week into our 2015 cruise and spent two full hot summer days painting the town red. With plenty of family-friendly activity options, we didn’t get to everything, but everything we did do was a home run. The ability to take our feet off the gas for a day or two also allowed Aaron and I to reflect on the cruise so far, and we’ve realized that cruising in Wisconsin is a very different thing than cruising the coast of Michigan. For one, every channel heading in from the lake is bookended by a (rundown) lighthouse on one side and a more prominent power plant on the other. Lighthouse tours are not in the tourist brochures here :). Another more important difference is that these are towns with harbors, rather than harbor towns. In Michigan, the ports are usually offshore and down a river, which means it’s a walk to get to the beaches, but your slip is in the epicenter of town, usually along a picturesque boardwalk, with streets lined with toy stores and coffee shops and restaurants not even a five-minute walk away. Here in Wisconsin, the marinas are just inside a break wall off of the lake, so you’re right by the coast, but quite a walk from, well, anything. These aren’t bad differences – they’ve just required a change in perspective. And we are definitely different as a cruising family this year – but more on that in another post :). In the meantime, we’re keeping the sails full and the compass pointed north! Dangling their feet in the refreshingly chilly water while we were anchored off of Kohler Park Dunes. Claire’s first bus ride! The city offers a shuttle Monday through Saturday, where you can ride all day for $1 and hit all of the major tourist areas around town. Luckily, our marina was one of the stops! Above and Beyond Children’s Museum. The farmers market was coupled with Sheboygan’s Earthfest that Saturday. Claire loved the drum circle! I found this at Nest, a lovely shop on 8th Street. If only Claire were a little older! It warmed my heart to think of all of the adventures she could already put in there, and hopefully endless more to come. Our only family shot of the trip so far, along the Sheboygan River. Except who’s that lady with the crazy hair?! Sometimes, you have to stop and smell the farmers market flowers. Checking out the remains of the Lottie Cooper, which capsized in a gale off the coast of the town in 1894. Watching the bridge raise to let boats pass through the river. Claire was mesmerized – it’s so fun to watch things like this through the eyes of a child. After checking the weather and deciding not to sail out Sunday afternoon in 3- to 5-foot waves and 20mph gusts, we made a last-minute decision to spend the afternoon at Breaker Bay Waterpark at the ritzy Blue Harbor Resort.. Aaron surfed, we rocketed down tube slides, and lazed around the lazy river..
As far as long weekends go, this last one was pretty epic. 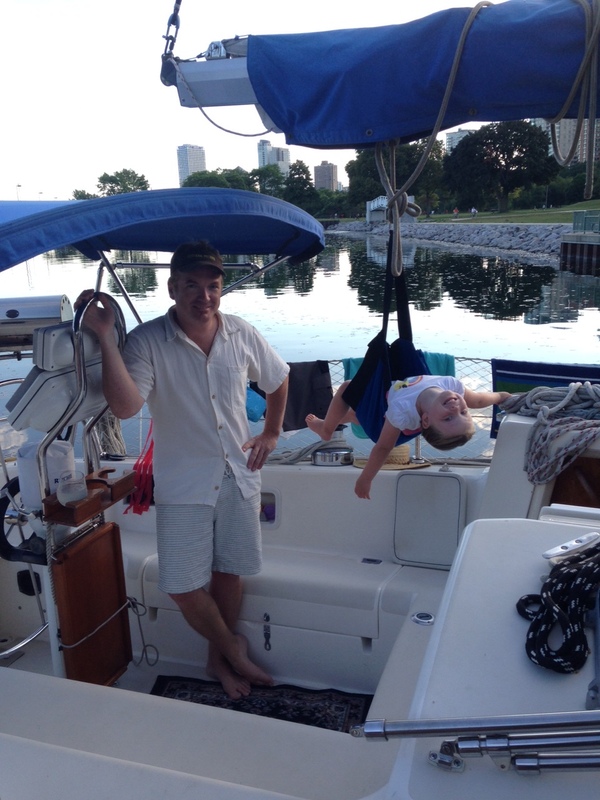 Over the course of four days, we managed to pack in the definition of Chicago summer on the water. Gusty afternoon sails and kites dancing off the docks. Burying each other at the beach, cannonballs in the pool and unending ice cream rivers running down our chins. Brats barbecued off the stern of Clarity, brunch on the bow of the club ship, and cocktails by candlelight. The soothing sound of water lapping against the paddle boards, and the deafening pound down below of a passing hail storm. This was our last full weekend in Chicago for awhile, as we leave this Saturday or Sunday to point north. First to Racine, then Milwaukee, then Port Washington, and then who knows? We’ll keep you posted along the way :).